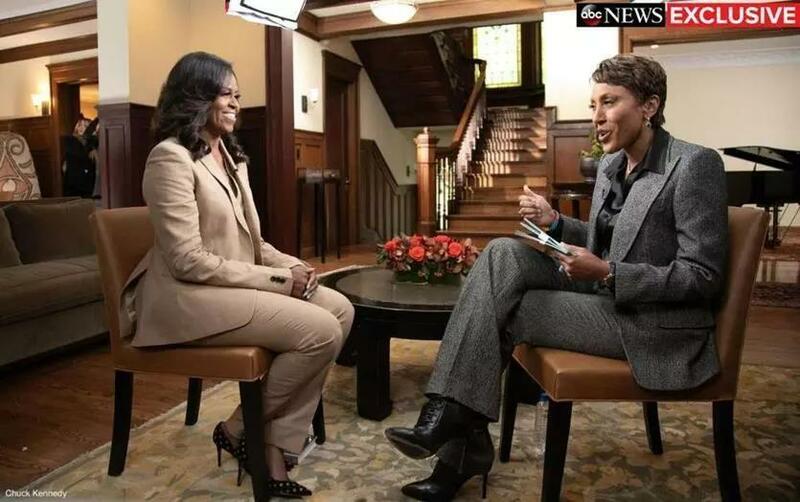 Michelle Obama was interviewed by ABC’s Robin Roberts. Former first lady Michelle Obama spoke about politics, miscarriages, fertility treatments, and marriage counseling during an interview with Robin Roberts on ABC’s “20/20” that aired Sunday night. The interview comes as Obama promotes her new memoir, “Becoming,” which is set to come out Tuesday. During the interview, Obama talked about how she felt when she met her husband, future president Barack Obama, at a Chicago law firm. Michelle said when she was asked to mentor Barack, who was still a first-year Harvard Law student at the time, she originally thought of him as off-limits — “I’m not going to date one of the few black summer associates,” she said. But then he walked into the room. Michelle said she originally tried to fend off Barack’s advances, but he eventually wore her down. “He was like, ‘You’re crazy. We should date. I like you, you like me.’ And I liked that about him. He was very straightforward. He wasn’t playing games,” she said. “That’s not something you expect to hear or read from a first lady,” Roberts pointed out during the interview. “I don’t know what to tell you. It was there. It still is. I love my husband a lot,” she said. However, the former first also spoke about some heavy subjects — for example, about how she went through a miscarriage weeks after getting pregnant. “I felt lost and alone. I felt like I failed because I didn’t know how common miscarriages were because we don’t talk about them,” she said. She also said that both of her daughters, Sasha and Malia, were conceived through in vitro fertilization. She also talked about how she and her husband turned to marriage counseling, which helped the pair learn how to talk through their disagreements. “What I learned about myself was that my happiness was up to me. And I started working out more. I started asking for help, not just from him, but from other people. I stopped feeling guilty,” she said. When asked about the current state of politics, Obama preached about the importance of casting a ballot in American elections. She also declined to offer her thoughts about how she thinks Melania Trump is doing as current first lady. However, Obama did note that the current president’s wife has not reached out to her with any questions. And when Roberts asked about the current president and how he compares to the “no drama Obama” administration, the former first lady replied by saying that the commander in chief needs to have discipline, and read, and be knowledgable.